Crab legs deliver a rich, sweet meat that is ideal for entertaining or special occasions. Cooking them, however, can be tricky. You may just find the answers you’re looking for in our selection of Frequently Asked Questions. Are king crab legs pre-cooked? Most frozen king crab legs are pre-cooked, so they just need to be heated prior to serving. Baking, boiling, grilling, and steaming are the most common ways to cook king crab legs. Baking: Preheat your oven to 350 degrees. Place the crab legs in a shallow baking pan. Place about 1/8 of an inch of water in the pan. Cover with aluminum foil and bake for eight to 10 minutes. Boiling: Simply fill a large saucepan half full of cold water and bring to a boil. Add a tablespoon of salt and any seasoning you desire. When the water begins to boil, add the crab legs and reduce the heat to medium. Simmer for about six minutes before removing the crab legs from the water. Rinse and enjoy. Grilling: Brush olive oil or butter on all sides of the crab legs to prevent them from sticking. Place crab legs on a hot grill (at least 300 degrees) for about five minutes. Turn and cook for an additional five minutes or until they are heated all the way through. Remove from the grill and service with butter or sauce. Steaming: Simply place two cups of water and a tablespoon of salt in a pot and bring water to a boil. Place the crab legs on a rack above the boiling water. Once the water returns to a boil, cover and cook for six minutes or until the legs produce a cooked aroma. How big can king crabs get? King crabs can reach a carapace width of 11 inches and a leg span of six feet. How do you cook frozen king crab legs? It is always best to thaw your crab legs beforehand, but you can cook frozen king crab legs by placing them in a colander or steamer over rapidly boiling water. You will need to cover the pot and steam your frozen crab legs for about ten minutes or until they are completely heated. How many crab legs in a pound? Weight depends entirely on the species of crab. Red king crabs, for example, are measured by how many crab legs it takes to make 10 pounds. Fisherman do not count claws while weighing, but they usually package them anyway. King crab legs are usually 4/6 size, which means that you receive four to six legs per every 10 pounds. How many crab legs per person? Deciding how many crab legs to buy can be tough, especially when you take guests or side dishes into consideration. If your friends and family members are not big fans of seafood, you can safely plan for a half pound per person. If you know some serious seafood enthusiasts, plan for up to two pounds per person. How many snow crab clusters per person? 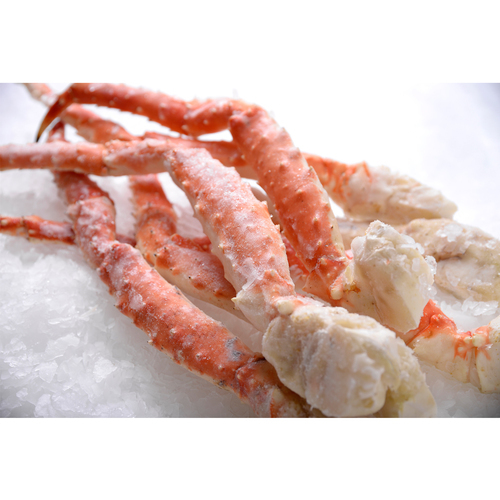 Snow crab clusters are a popular alternative to king crab legs. The same rule applies to buying snow crab clusters for a dinner party. Picky eaters may not need any more than a half pound of crab clusters, but avid seafood enthusiasts can usually eat up to two pounds per person. Snow crab clusters are sold with some meat of the body attached. Lump crab meat is a blend of broken pieces of jumbo lump and special grade crab meat. Most people use lump crab meat to make crab cakes, dips, salads, or casseroles. You can use lump crab meat to stuff fish, chicken, and more. How to cook crab legs with beer? Start with clean crab legs. If you’re cooking four to six crab leg clusters, pour two 12-ounce beer bottles into a large pot and bring to a boil uncovered. Add salt, pepper, and any seasonings you desire. Turn heat to medium, add legs, and cover. Allow the crab legs to cook for 10 to 12 minutes. Crab legs boiled in beer taste great with garlic butter. Pre-cutting your crab legs is one way to make serving easier. Remove a crab leg from the cluster by twisting it at the joint. Turn the crab over so the white side is up, and cut along one side of the leg from the joint to the tip. Repeat on the other side of the leg. Remove the cut shell to expose the meat inside. Cut all the other legs in the same manner before serving. This practice makes the meat easier to access with a small fork. Start by cracking the joints of the lower legs downward with the white part of the leg facing up. This way, you stand a good chance of removing any meat that clings to the cartilage. Once the leg is segmented, recover the bits of meat that cling to the cartilage and then cut the end off of each segment that still contains meat. What is backfin crab meat? Backfin crab meat contains large pieces of lump and some broken body meat. Crab pieces are smaller than lump, but they can still be used in many of the same recipes. If you can’t find the answer to your question, please contact Wholey’s today for further assistance.